Stay connected to the latest forecast with AccuWeather – Weather for Life. 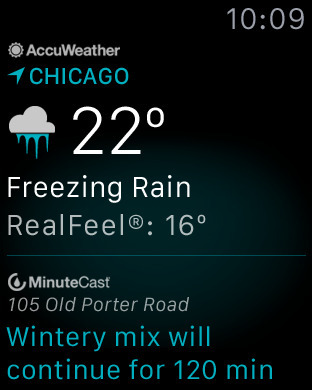 This award winning weather app features AccuWeather MinuteCast®, the leading minute-by-minute precipitation forecast that is hyper-localized to your exact street address or GPS location – all without any advertising! 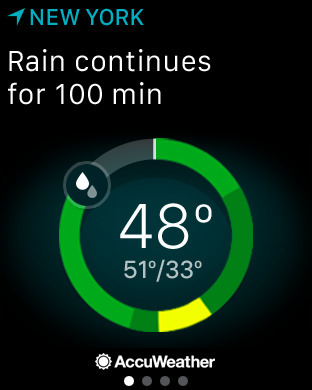 Now supporting Apple Watch, this app offers the same world-class, synchronized app experience across your iOS devices. 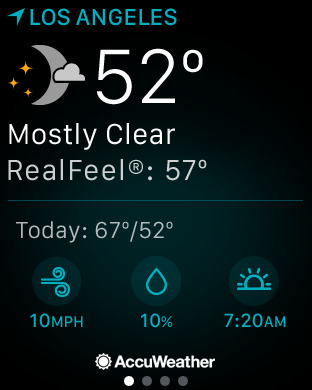 See the current temperature, cloud conditions, and RealFeel. Also see wind conditions, chance of rain, and sunrise/sunset times. See the current temperature and other weather conditions, along with how long the weather is expected to last. Every day over a billion people worldwide rely on AccuWeather to help them plan their lives, protect their businesses, and get more from their day. AccuWeather provides hourly and Minute by Minute™ forecasts with Superior Accuracy™ for any longitude/latitude on Earth, with customized content and engaging video presentations available on smart phones, tablets, free wired and mobile Internet sites, connected TVs, and Internet appliances, as well as via radio, television, and newspapers. Founded in 1962 by Dr. Joel N. Myers - a Fellow of the American Meteorological Society who was recognized as one of the top entrepreneurs in American history by Entrepreneur Magazine's Encyclopedia of Entrepreneurs - AccuWeather also delivers a wide range of highly-customized enterprise solutions to media, business, government, and institutions, as well as news, weather content, and video for more than 180,000 third-party websites. AccuWeather's CEO, Barry Lee Myers, is an award winning leader in global weather information issues and one of the world's most recognized advocates for cooperative relationships between government weather agencies and the weather industry. He is a leader in the digital weather information space.